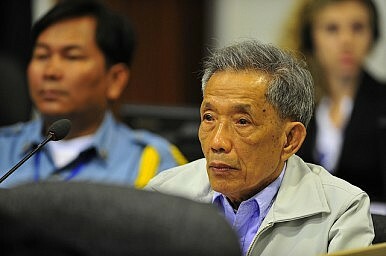 Kaing Guek Eav, commandant of the S21 death camp, will now spend the rest of his life in jail. The Supreme Chambers of the Khmer Rouge Tribunal has dismissed an appeal by the former commandant of the S21 death camp and increased his sentence to life, ensuring he will die behind bars for the torture and deaths of thousands of people. In 2010 Kaing Guek Eav, alias Duch, was found guilty of murder, torture and crimes against humanity by the United Nations-backed court. He was sentenced to 35 years behind bars, but this was commuted to 19 years. Five years was wiped off because he had been illegally detained by a military court while waiting for the current tribunal to be established. His sentence was further reduced by 11 years for time already spent behind bars. Duch, a former mathematics teacher, had been held in detention since he was found working as a Christian aid worker in the Cambodian jungle in 1999. He wasn’t formally arrested by the tribunal until July 2007, once it was formally established and investigations completed. Following his convictions, prosecutors had initially sought 40 years, but the court balked and handed down a reduced term, raising the prospect that Duch could have been released in 2029 at the age of 87. In dismissing the appeal, however, the Supreme Chambers said the original sentence “did not reflect the gravity of the crimes” and increased the term to life. Kong Srim also said Duch should spend the rest of his life behind bars, although he added the appeals court didn’t have the jurisdiction to rule on any future parole and noted that Duch had now spent more than 12 years in prison. Importantly for the survivors of the Khmer Rouge, blamed for the deaths of up to 2.2 million people between April 1975 and January 1979, Duch is unlikely to ever see the outside of a prison again. Many were upset by the initial sentence and the prospect that he could eventually walk out of jail a free man. In court, watched around the world via Internet, Duch sat impassively for most of the deliberations. However, he visibly winced when the judge rejected an assertion that the trial chambers didn’t hold a mandate to prosecute him because he wasn’t considered among the most important Khmer Rouge figures. Under Duch’s leadership water boarding, asphyxiation and electrification were widely practiced alongside disembowelment while operations were performed on prisoners without an anesthetic. Prisoners were then processed and documented with forced confessions elicited before being sent to the nearby Killing Fields, where they were bludgeoned to death with an iron bar to the nape of the neck. The prosecution provided the court with the names and details of more than 12,000 victims, however, it’s widely accepted that up to 25,000 people were killed. Duch has no more avenues of appeal.